Lahti is a city and municipality in Finland.Lahti is the capital of the Päijänne Tavastia region. 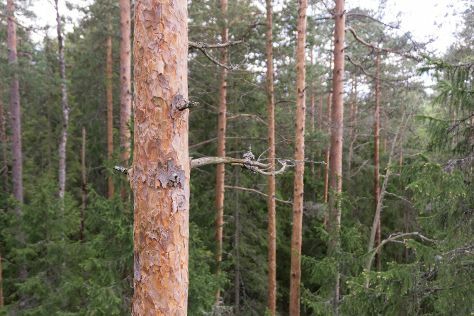 Get in touch with nature at Niivermaki Nature Conservation Area and Linna Golf & Country Club. Venture out of the city with trips to Haemeenlinna (Hame Castle, Palander House, & more). There's much more to do: examine the collection at Motorcycle Museum of Finland, pause for some serene contemplation at Ristinkirkko, take a stroll around Sibelius Hall, and ponder the design of Musical Fountain. To find ratings, more things to do, reviews, and more tourist information, go to the Lahti travel planner . London, UK to Lahti is an approximately 8.5-hour flight. You can also drive. The time zone difference moving from Greenwich Mean Time to Eastern European Time is 2 hours. In July, daytime highs in Lahti are 24°C, while nighttime lows are 15°C. Cap off your sightseeing on the 9th (Tue) early enough to catch the train to Lappeenranta. 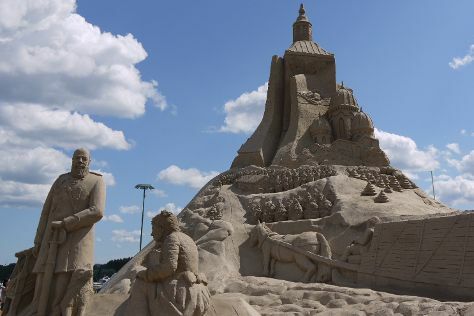 Kick off your visit on the 10th (Wed): step into the grandiose world of Sandcastle Lappeenranta, see the interesting displays at Wolkoff House Museum, then pause for some serene contemplation at Lauritsala Church, and finally contemplate the waterfront views at Saimaa Canal. Get ready for a full day of sightseeing on the next day: take in the spiritual surroundings of Lappeen Marian kirkko, look for gifts at MyGoodKnife, then see the interesting displays at Lappeenranta Fortress, and finally take in the architecture and atmosphere at Church of the Intercession of the Mother of God. To find maps, reviews, photos, and tourist information, refer to the Lappeenranta trip itinerary planner . Traveling by train from Lahti to Lappeenranta takes 1.5 hours. Alternatively, you can drive; or take a bus. In July, plan for daily highs up to 24°C, and evening lows to 15°C. Cap off your sightseeing on the 11th (Thu) early enough to go by car to Mikkeli. Mikkeli is a town and municipality in Finland. Get in touch with nature at Repovesi National Park and Neitvuori. There's still lots to do: head outdoors with Anjan Puisto, don't miss a visit to Kenkavero, take in panoramic vistas at Naisvuori Observation Tower, and take in the architecture and atmosphere at Mikkeli Cathedral. You can plan Mikkeli trip in no time by asking Inspirock to help create your itinerary. Traveling by car from Lappeenranta to Mikkeli takes 2 hours. Alternatively, you can take a bus. In July, plan for daily highs up to 25°C, and evening lows to 12°C. Wrap up your sightseeing on the 14th (Sun) to allow time to drive to Savonlinna. Kick off your visit on the 15th (Mon): examine the collection at Savonlinna Provincial Museum, explore the historical opulence of Olavinlinna Castle, take in the architecture and atmosphere at Pikkukirkko, stop by Taito Shop Savonlinna, then pause for some photo ops at Savonlinna Herostatue - The Hero's Grave, and finally pause for some serene contemplation at Savonlinna Cathedral. To see traveler tips, more things to do, reviews, and other tourist information, read Savonlinna online route planner . Traveling by car from Mikkeli to Savonlinna takes 1.5 hours. Alternatively, you can take a bus. In July, daytime highs in Savonlinna are 24°C, while nighttime lows are 13°C. Finish up your sightseeing early on the 15th (Mon) so you can go by car to Kuopio. Kuopio is a city and a municipality located in the region of Northern Savonia, Finland. Escape the urban bustle at Valkeisenlampi and Honkaniemi Beach. Change things up with a short trip to Utra Beach in Joensuu (about 1h 55 min away). And it doesn't end there: take in panoramic vistas at Puijo Tower, enjoy some friendly competition at Entertainment Center IsoCee, enjoy some diversion at Vainolanniemi, and tour the pleasant surroundings at Saaristokatu. For more things to do, reviews, traveler tips, and more tourist information, go to the Kuopio trip website . You can drive from Savonlinna to Kuopio in 2.5 hours. Alternatively, you can do a combination of bus and train; or take a bus. In July, daily temperatures in Kuopio can reach 24°C, while at night they dip to 15°C. Cap off your sightseeing on the 19th (Fri) early enough to catch the train to Jyvaskyla. Jyväskylä is a city and municipality in Finland and in the western part of the Finnish Lakeland. On the 22nd (Mon), spend an exhilarating day on the slopes at Laajis. The adventure continues: see the interesting displays at The Alvar Aalto Museum, get a new perspective on nature at Natural History Museum of Central Finland, take an in-depth tour of Finnish Air Force Museum, and make a trip to University of Jyvaskyla. Plan a trip to Jyvaskyla easily and quickly by telling Inspirock to suggest an itinerary. Take a train from Kuopio to Jyvaskyla in 2 hours. Alternatively, you can take a bus; or drive. In July, daily temperatures in Jyvaskyla can reach 24°C, while at night they dip to 12°C. Wrap up your sightseeing on the 22nd (Mon) early enough to take a train to Tampere. Get in touch with nature at Hatanpaa Arboretum and Duck Park (Sorsapuisto). Venture out of the city with trips to Yyteri Beach (in Pori) and Seitsemisen Kansallispuisto (in Ylojarvi). see Sarkanniemi Theme Park. There's still lots to do: take in the spiritual surroundings of Tampere Cathedral, take in the architecture and atmosphere at Finlayson Church, examine the collection at Vapriikin Museokeskus, and steep yourself in history at Amuri Museum of Workers' Housing. To find traveler tips, ratings, reviews, and other tourist information, you can read our Tampere trip itinerary tool . Getting from Jyvaskyla to Tampere by train takes about 2 hours. Other options: drive. Expect a daytime high around 24°C in July, and nighttime lows around 13°C. Wrap up your sightseeing on the 28th (Sun) early enough to travel back home.